Tilting at, knocking down, building, and rebuilding windmills. Husband, father of three (23y, 16y, 14y), coach, director. I've been racing bikes for 35 years. We specialize in working with athletes who aren't on the fast track to success, or who aren't connected with the USAC talent pathway. We believe in the blue collar approach. We believe athletes who are parents want to compete AND have family time. I am a full time cycling coach since 1999. I also spent a few years as a director for Slipstream Sports (Garmin-Sharp) directing the development team. With my wife, Chloe, we also run a residence program for athletes who are taking that extra level of commitment to the extent that they live here with us full time. We also spend 3-4 months per year living in Belgium and Italy to help athletes develop to the elite level and otherwise get that racing and living experience that can only be had in the heartland of bicycle racing. We do this for athletes who aren't part of the national team or national program, because we believe everyone deserves the opportunity to become the best that they can be. I've coached riders to over 100 national championship podiums (we've stopped counting) and over 20 gold medals there. I've coached 15 rider to world championships, including a podium performance there. I've had riders represent USA at the World Championships for the last eight years. This is from someone who isn't currently on USAC staff, and I'm not a former pro. I've been head coach at camps in Mallorca, Italy, Belgium, and in the US. I've been coach and head coach for the USAC Regional Development Camp. To show we aren't a one trick coaching operation, I've coached riders to the national team on the track, road, cross, and mountain bike. I've directed for Team USA at the Pan Am games for road and track. 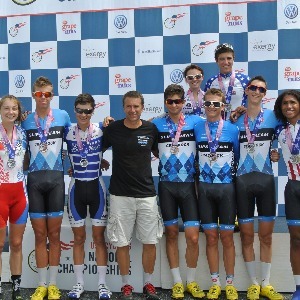 I've coached more than 20 riders to the US National team. Success. Coach Christian Williams has been notified of your message.